To Cite: Zhang X, An Y, Jiang X, Xu M, Xu L, et al. 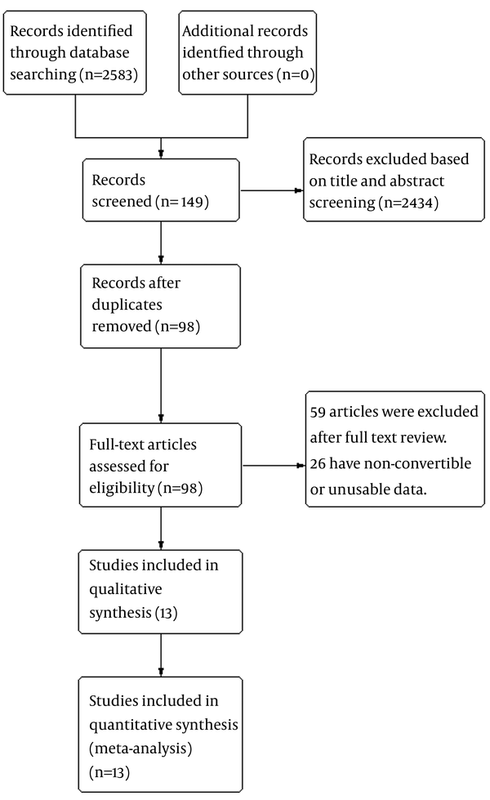 Entecavir Versus Lamivudine Therapy for Patients With Chronic Hepatitis B-Associated Liver Failure: A Meta-Analysis, Hepat Mon. 2014 ; 14(11):e19164. doi: 10.5812/hepatmon.19164. Background: Nucleoside analogues are recommended as antiviral treatments for patients with hepatitis B virus (HBV)-associated liver failure. Clinical data comparing entecavir (ETV) and lamivudine (LAM) are inconsistent in this setting. Objectives: To compare the efficacy and safety of ETV and LAM in patients with chronic hepatitis B (CHB)-associated liver failure. Patients and Methods: A literature search was performed on articles published until January 2014 on therapy with ETV and LAM for patients with CHB-associated liver failure. Risk ratio (RR) and mean difference (MD) were used to measure the effects. Survival rate was the primary efficacy measure, while total bilirubin (TBIL), prothrombin activity (PTA) changes and HBV DNA negative change rates were secondary efficacy measures. A quantitative meta-analysis was performed to compare the efficacy of the two drugs. Safety of ETV and LAM was observed. Results: Four randomized controlled trials and nine retrospective cohort studies comprising a total of 1549 patients were selected. Overall analysis revealed comparable survival rates between patients received ETV and those received LAM (4 weeks: RR = 1.03, 95%CI [0.89, 1.18], P = 0.73; 8 weeks: RR = 0.98, 95% CI [0.85, 1.14], P = 0.84; 12 weeks: RR = 0.98, 95% CI [0.90, 1.08], P = 0.70; 24 weeks: RR = 1.02, 95% CI [0.94, 1.10], P = 0.66). After 24 weeks of treatment, patients treated with ETV had a significantly lower TBIL levels (MD = -37.34, 95% CI [-63.57, -11.11], P = 0.005), higher PTA levels (MD = 11.10, 95% CI [2.47, 19.73], P = 0.01) and higher HBV DNA negative rates (RR = 2.76, 95% CI [1.69, 4.51], P < 0.0001) than those treated with LAM. In addition, no drug related adverse effects were observed in the two treatment groups. Conclusions: ETV and LAM treatments had similar effects to improve 24 weeks survival rate of patients with CHB-associated liver failure, but ETV was associated with greater clinical improvement. Both drugs were tolerated well during the treatment. It is suggested to perform further studies to verify the results. Hepatitis B virus (HBV) is a major cause of morbidity and mortality worldwide. China has one of the world’s highest rates of HBV infection despite availability of an effective vaccine (1). It is estimated that 93 million individuals in China are infected with HBV, including 20 million with active chronic hepatitis B (CHB) (2). Patients with chronic HBV infection are at an increased risk of developing liver cirrhosis and hepatocellular carcinoma (3). In some cases, patients may develop severe acute exacerbations, resulting in liver failure and death. Liver failure is inability of the liver to perform its normal synthetic, metabolic, excretory and biotransformation functions, and it is usually manifested as coagulopathy, jaundice, ascites and hepatic encephalopathy (4). In China, HBV infection is the leading cause of liver failure, which can develop to acute liver failure (ALF), subacute liver failure (SALF), acute on chronic liver failure (ACLF) or chronic liver failure (CLF) (5). HBV-induced liver failure is usually severe and associated with a high mortality rate (5). In the “Guidelines for the Diagnosis and Treatment of Liver Failure” (6), “Acute on Chronic Liver Failure: Consensus Recommendations of the Asian Pacific Association for the Study of the Liver” (7) and “AASLD Position Paper: The Management of Acute Liver Failure: Update 2011” (8) reports, nucleoside analogue (NA) drugs were recommended as antivirus treatment for patients with HBV-associated liver failure. Both entecavir (ETV) and lamivudine (LAM) are NAs with a high antiviral activity. ETV is the strongest commercially available NA and the first line drug for HBV treatment in China market. ETV is also clearly superior to LAM as a therapy for CHB (9), and ETV appears to be better than LAM for patients with HBV-associated liver failure, at least theoretically. Nevertheless, clinical data are inconsistent regarding the efficacy of ETV and LAM in this clinical setting (10-12). Studies performed by Huo (10) and Lei (11) indicated that the efficacy of ETV was better than LAM, while Jing Lai’s study (12) showed that short-term efficacy of ETV versus LAM was similar for patients with ACLF. ETV was reported to be potentially related to fatal lactic acidosis in severely decompensated patients with cirrhosis (13). Furthermore, investigators from Hong-Kong reported a mortality rate of 19% in ETV treated patients with acute exacerbation of CHB compared to only 4% in LAM treated controls (14). In this study, 36 and 117 patients were treated with ETV and LAM, respectively. By week 48, seven patients in the ETV group and five patients in the LAM group died. They concluded that ETV treatment was associated with increased mortality in patients with severe acute exacerbation of CHB. The reason for increased short-term mortality in ETV-treated patients was not completely understood. Although many studies were conducted to evaluate the effects of ETV or LAM in the treatment of patients with CHB-associated liver failure, few systematic reviews compared the efficacy of the two drugs. Therefore, we conducted a meta-analysis of prospective and retrospective studies to explore the efficacy and safety of ETV compared to LAM in patients with CHB-associated liver failure. We aimed to compare the efficacy and safety of ETV and LAM in the treatment of patients with CHB-associated liver failure. We searched PubMed, EMBASE, Scopus, Web of science, Cochrane Library, Chinese BioMedical Literature (CBM), Chinese National Knowledge Infrastructure (CNKI), Chinese Technological Journal of Database (VIP) and Wanfang databases for eligible articles until January 2014 without language and publication limitations. We applied a free key word or mesh word searching with the following terms: severe hepatitis B, chronic severe hepatitis B, liver failure, hepatic failure, acute on chronic liver failure, acute exacerbation, severe acute exacerbation, hepatitis B virus, hepatitis B virus infection, HBV, entecavir, ETV, lamivudine, LAM, nucleoside analog* and nucleotide analog*. After finding all articles fulfilling our selection criteria, we used search engines (i.e. Google and Baidu) to search gray literature relevant to our study. In addition, a manual search of abstracts of international liver meetings, reference lists of retrieved articles and qualitative topic reviews was performed. Survival rate was the primary efficacy measure for this analysis. TBIL, PTA changes and HBV DNA negative change rate were secondary efficacy measures. The safety of ETV and LAM was also observed. Two reviewers (Xiaoguo Zhang and Yong An) independently selected the studies and extracted data and outcomes according to inclusion and exclusion criteria. Cohen's kappa coefficient was used to measure the agreement between the two reviewers. In cases of disagreement between the two reviewers, a third reviewer (Shijun Chen) examined the data and discussed the choices with the two initial reviewers. Data was incorporated only when the three reviewers reached a consensus. Collected information included basic information on the studies, sample sizes, receiver characteristics and the results. Quality assessment of included studies was performed. For RCTs, methodological quality was evaluated using the Cochrane risk of bias tool (random sequence generation, allocation concealment, blinding of participants and personnel, blinding outcome assessment, incomplete outcome data, selective reporting and other sources of bias) described in the Cochrane Reviewer’s Handbook 5.1.0. For observational cohort studies, methodological quality was assessed using the Newcastle-Ottawa Scale (NOS) (16) with some modifications to match the needs of this study. This measure assessed aspects of methodology in observational studies related to study quality, including selection of cases, comparability of populations, and assessments of outcome. Studies were graded on an ordinal star scoring scale with higher scores (more stars) representing studies of higher quality. Analysis was performed by reviewing manager version 5.2.9 (Rev Man 5.2.9 from Cochrane Collaboration). Among the indicators compared, risk ratio (RR) and 95% confidence interval (95% CI) were used to compare survival and HBV DNA negative change rates. Mean difference (MD) and 95% CI were used to compare TBIL and PTA changes. Collected data heterogeneity was measured using the Cochran’s Q (Chi-square χ2 test) and I² tests. Fixed or random effect model was used depending on the absence or presence of significant heterogeneity. In our meta-analysis, P > 0.10 in Cochran’s Q test and I2 < 25% signified no heterogeneity, and the fixed effects model was adopted when data was pooled across studies. Otherwise, the random effects model was used. For all tests, except for tests of heterogeneity, P < 0.05 was considered statistically significant. Funnel chart and trim and fill method (17) were used to detect possible publication biases. Sensitivity analysis was performed to evaluate validity and reliability of primary meta-analysis. Thirteen studies comprising 1549 patients fulfilled the criteria for this meta-analysis. There was an acceptable agreement between the two reviewers for study selection (Kappa coefficient: 0.77). Of thirteen studies included, four (11, 18-20) were RCT and nine (10, 12, 21-27) were retrospective cohort studies. In total, 797 cases were included in the ETV group, and 752 cases in the LAM group. The process of selecting eligible studies in our meta-analysis is shown in Figure 1. All included studies were performed in China and reflecting the high incidence of HBV infection in China. Four articles were published in English and the rest in Chinese. Of these studies, the shortest follow-up time was 4 weeks and the longest was 24 weeks. Characteristics of included studies are shown in Table 1. The overall quality of included RCTs in this meta-analysis was suboptimal. None of four RCTs reported how the allocation sequences were generated. Three studies (11, 19, 20) did not report the methods of allocation concealment, and one study (18) took an open random allocation schedule. None of the trials referred to blinding method. Methodological quality of RCTs is shown in Table 2. Quality of included observational cohort studies was assessed, and each of the studies had at least six stars. Two studies (22, 25) did not describe the comparability of ETV and LAM groups. The study conducted by Jing Lai (12) recruited hepatitis B e antigen (HBeAg) negative patients with ACLF but not HBeAg positive patients, thus limiting the representative capacity of this study. Quality of retrospective studies is shown in Table 3.
a Abbreviations: TBIL, total bilirubin; ALT, alanine transaminase; PTA, prothrombin activity; RTC, randomized controlled trial. Four studies (19, 24, 26, 27) comprising 377 patients reported four weeks survival. One hundred and ninety five patients in the four studies used ETV and 182 used LAM. According to χ2 and I2 analyses, studies were significantly heterogeneous (χ2 = 4.57, P = 0.21 and I2 = 34%); therefore, random effect method was used to analyze data. Survival rates were comparable between the two treatment groups (79.5% versus 79.1%, RR = 1.03, 95% CI [0.89, 1.18], P = 0.73) (Figure 2). Subgroup analysis was also conducted. 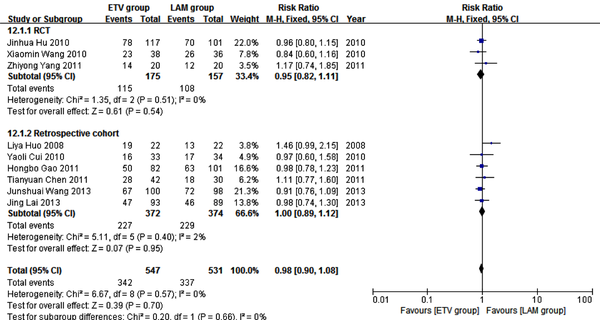 In RCT subgroup, survival rates were not significantly different between the ETV and LAM groups. In the retrospective cohort subgroup, survival rates were comparable between the two treatment groups (RR = 1.04, 95% CI [0.85, 1.26], P = 0.72). Three retrospective cohort studies (24, 26, 27) comprising 337 patients reported eight weeks survival. 175 patients in the three studies used ETV and 162 used LAM. These studies were not significantly heterogeneous (χ2 = 1.08, P = 0.58 and I2 = 0%); therefore, the fixed effect model was used to analyze the data. Survival rates were not significantly different between the two treatment groups (RR = 0.98, 95% CI [0.85, 1.14], P = 0.84) (Figure 3). Nine studies (10, 12, 18-20, 24-27) comprising 1078 patients reported 12 weeks survival. In these studies, 547 patients received ETV, and 531 patients received LAM. In heterogeneity test, χ2 = 6.67, P = 0.57, and I2 = 0% (Figure 4), suggesting no significant variability among the included studies; therefore, the fixed effect model was used to analyze data. Survival rates were not significantly different between the two treatment groups (RR = 0.98, 95% CI [0.90, 1.08], P =0.70). Subgroup analysis showed comparable survival rates between the two treatment groups in both the RCT and retrospective cohort subgroups (Figure 4). Five studies (11, 18, 21-23) comprising 689 patients reported 24 weeks survival. 367 patients in these studies received ETV and 322 patients received LAM. 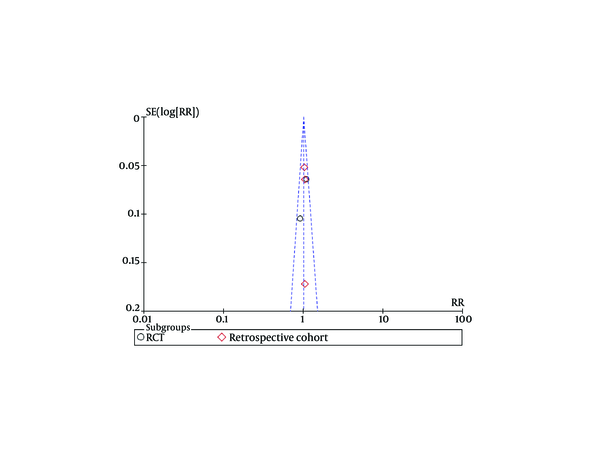 No heterogeneity was observed according to χ2 and I2 analyses, (χ2 = 2.76, P = 0.60 and I2 = 0%); therefore, the fixed effect method was used to analyze the data. Survival rates were comparable between the two treatment groups (RR = 1.02, 95% CI [0.94, 1.10], P = 0.66) (Figure 5). Subgroup analysis showed no significant difference in survival rates between the ETV and LAM treatment groups. In this analysis, data regarding TBIL, PTA and HBV DNA negative change rates were available from only three studies (11, 21, 23). Patients in each of these studies were followed up for 24 weeks. We compared the impact of ETV and LAM on these indexes. Heterogeneity was analyzed using χ2 and I2 tests (TBIL: χ2 = 21.80, P < 0.0001 and I2 = 91%; PTA: χ2 = 12.79, P = 0.0002 and I2 = 84%; HBV DNA negative rate: χ2 = 0.32, P = 0.85 and I2 = 0%), and the fixed or random effect model was used depending on the absence or presence of significant heterogeneity. Our results showed that patients treated with ETV had significantly lower TBIL levels (MD = -37.34, 95% CI [-63.57, -11.11], P = 0.005) (Figure 6), higher PTA levels (MD = 11.10, 95% CI [2.47, 19.73], P = 0.01) (Figure 7) and higher HBV DNA negative rates (RR = 2.76, 95% CI [1.69, 4.51], P < 0.0001) (Figure 8) after 24 weeks treatment. Subgroup analysis showed that ETV was more effective than LAM to decrease HBV DNA level and improving liver function. Of seven studies (10, 12, 18, 19, 22, 24, 26) reporting safety of ETV and LAM in treating CHB-associated liver failure, none reported drug-related adverse events or drug-related viral mutation. To confirm the stability of the primary analysis, we conducted sensitivity analysis using different statistical approaches (e.g. using the random effect model besides a fixed effect one); we also performed sensitivity analysis by excluding studies one by one. We found that results did not change significantly, suggesting the stability of this meta-analysis results. 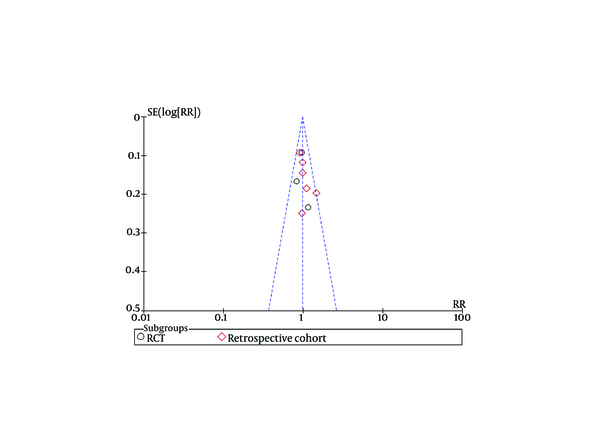 Funnel plots of studies used in this meta-analysis reporting 12 weeks and 24 weeks survival are shown in figures 9 and 10, respectively (Funnel plots for other survival time-points are not presented). None of the studies lay outside the limits of 95% CI. The trim and fill method analysis obtained the theoretical pooled estimate RR (12 weeks: RR = 0.86, 95% CI [0.68, 1.09], P = 0.20; 24 weeks: RR = 0.88, 95% CI [0.62, 1.24], P = 0.46) after theoretically unreported studies (3 and 3 for 12 and 24 weeks, respectively) were added and the results did not affect the outcome of the meta-analysis. Therefore, no evidence of publication bias was found in our study. Figure 9. Funnel Plots for Studies Evaluating Twelve Weeks Survival. CHB-associated liver failure has a high mortality rate and is one of the most difficult to treat liver diseases. The disease mechanism is rather complicated and remained unclear. One of the important mechanisms is the high level of HBV replication and protein antigen expression on target cell surfaces, which often leads to an overactive immune response, especially the cytotoxic T lymphocyte (CTL) reaction to infected hepatocytes. This mechanism is necessary for HBV clearance and causes significant apoptosis and necrosis of hepatocytes (28-30). Zhao’s study on the cause and outcome of chronic and acute liver failure showed that HBV replication and mutation were primary factors related to liver failure (31). Therefore, a reasonable solution for treating CHB-associated liver failure would be inhibiting HBV replication within the body and relieve immune hyperactivity using antiviral drugs. Many studies (26, 32-34) found that both ETV and LAM were effective to treat hepatitis B-associated liver failure. Patients treated with either of the two agents showed higher survivals, significant decrease of HBV DNA levels and higher clinical and biochemical responses compared to those not treated with any NA. As liver function is poor in patients with liver failure and the progression of disease is fast, selection of an appropriate antiviral drug in this setting is especially important. A study conducted by Sun QF showed that prognosis of patients with CHB-associated severe liver disease might be related to pretreatment HBV DNA load (35). Accordingly, it is possible that this group of patients would benefit from more potent anti-HBV drugs, which could decrease viral load more rapidly. ETV was demonstrated to be superior to LAM in suppressing HBV replication (36, 37). Therefore, it seems more reasonable to use ETV to treat patients with CHB-associated liver failure. In the present study, we included RCTs and observational cohort studies to compare the effects of ETV and LAM in patients with CHB-associated liver failure. Our data showed that patients treated with ETV had significantly lower TBIL levels, higher PTA levels and higher HBV DNA negative rates after 24 weeks of treatment. However, we found no significant difference between ETV and LAM to improve short-term survival. Interestingly, these results were consistent with a prior report conducted by Yaochun Hsu (38). In that study, 126 consecutive treat-naïve patients received either ETV (n = 53) or LAM (n = 73) for decompensated CHB. After one year of follow-up, effects of ETV and LAM on mortality rate were similar, but ETV was associated with greater clinical improvement among CHB survivors who recovered from hepatic decompensation. While explanations for discrepancy between laboratory improvement and survival benefits are currently unclear, insufficient sample sizes and inadequate observation periods are probable candidates. Besides, liver failure in some patients may already reach irreversibility beyond the rescue of viral suppression, and hence antiviral therapy would not affect short-term mortality in these patients. Data comparing the efficacy of long-term treatment with ETV and LAM for patients with liver failure is lacking in the available literature, which might be due to severity of liver disease, poor prognosis of patients or high mortality rates restricting the continuation of long-term trials. There has been a particular concern for administration of ETV in patients with CHB-associated liver failure, because severe lactic acidosis during treatment of CHB with ETV occurred more often in patients with impaired liver function, especially in those with high MELD scores and multi-organ failure (13). However, in clinical trials for patients with decompensated liver disease due to CHB, lactic acidosis rarely occurred in ETV receivers and did not affect the safety profile compared to other NAs (39, 40). In our included studies, no severe adverse reactions were reported in the two treatment groups. Based on these data, we considered both ETV and LAM to be safe and tolerable for patients with HBV-related live failure. Our study had several limitations. First, total number of included trials was small, and some did not include all outcome parameters aimed to be analyzed in this study at different follow-up time points. Second, only four RCTs were included and the quality of these RCTs was suboptimal. Third, all included studies were conducted in China, so our conclusions might not be generalizable to other populations. Lastly, we restricted our research to articles published in full text, which might make us omit high-quality studies published in abstract form. It is suggested to assess high-quality, well-designed and multicenter RCTs with larger sample sizes in future studies. In conclusion, ETV and LAM had similar effects to improve 24 weeks survival rate for patients with CHB-associated liver failure, but ETV was associated with greater clinical improvement among those who survived. In addition, both ETV and LAM were well tolerated during the treatment. Further studies are needed to verify these results. This work was supported by Jinan Infectious Disease Hospital. We thank Prof. Zhuangbo Mu (president of Jinan Infectious Disease Hospital) for his advice for this study. We also thank the members of Prof. Shijun Chen’s Laboratory for their helpful discussion and critical reading of the manuscript. Authors’ Contributions: Study conception and design: Shijun Chen and Yaguang Xi. Data acquisition and analysis: Xiaoguo Zhang, Yong An, Xuemei Jiang, Minling Xu and Linlin Xu. Writing of the paper: Xiaoguo Zhang. Critical revision: Shijun Chen and Yaguang Xi. All authors read and approved the final manuscript. Funding/support: This work was supported by Jinan Infectious Disease Hospital.